Being a parent of two or more little people? Especially when one of those little people is a baby and needing of a whole lot of your time and attention. An issue that's been coming up for us in workshops and our facebook community recently is how to respond when your toddler hurts the baby. Seeing your baby hurt naturally arouses your protective mama-bear response and it's all too easy to take out those difficult feelings on your toddler. Crying baby, crying toddler and one very tired, frustrated parent. Lets step back and look at the bigger picture. Having a sibling arrive is one of the biggest events in a child's life. Especially for your firstborn, who was up until that moment in sole possession of your love and attention. It's a pretty big shift to make and developmentally normal for your toddler to have some mixed feelings towards the tiny inteloper. It's important to recognise that this isn't just normal when baby first arrives, siblings can continue to feel resentful well into the first or second year of life unless we take mindful steps towards creating a positive relationships. So how should you respond when your toddler hurts the baby? Step 1 - Fill their emotional cup first. It's no secret that babies can be pretty demanding little people. Between feeding, changing and just generally keeping them happy many mums can feel like they've barely had a second to themselves, let alone time to play with their older child. You know what I'm going to say right? We need to carve out time to spend with our toddlers - they miss us. They wish it was them sleeping close to mum and dad, being constantly cuddled and tended to. Use whatever support systems you have to spend some quality one-on-one time with your older child. As little as fifeteen minutes of uninterrupted, mindful presence consistently a couple of times a day can make all the difference. This time reassures your child that he's just as loved as he was before the new arrival and helps him to fill up his emotional cup so that when the baby needs you he's not already running on empty. If you know that your older child can't be left alone without hurting the baby then don't put them in that situation. It won't be forever, especially if you take the step above but expecting your toddler to have self-control is only going to create feelings of frustration for everyone. Once you start feeling more confident you can practise leaving your toddler for a few moments at a time, making sure to give lots of praise for how well they looked after the baby upon your return. Engaging your toddler as a co-operative partner in the care of their sibling can help to grow those proud big sibling feelings rather than those of resentment. Can't we all just get along! *This post may contain affiliate links for products of interest. Clicking them takes you through to a website and if you buy we receive a small commission. This helps us to keep on writing! Thank you. Okay so prior preparation is great but what should you actually do when your toddler hurts the baby? Take a few moments to calm yourself first before responding to your toddler. Your first point of call is the injured party, rather than saying anything to your older child pick up baby and let them know that you understand they've been hurt. Speaking in a calming tone, offer comfort to your baby acknowledging their feelings. This takes the focus off your toddler so they aren't getting negative attention for their behaviour but also it more importantly models the behaviour we want to help your toddler develop - feelings of empathy and love towards their sibling. This isn't about speaking in a pointed way to induce shame in your toddler, in fact your attention should be wholly on the baby and making sure that they're okay. The combination of modelling and time gives your toddler a few moments to process their behaviour. If you were to enter the situation snapping and shouting, your toddler would immediatly be on the defensive and most likely respond with a meltdown of their own. This response is modelled from Dr Laura Markham's book; Calm Parents, Happy Siblings. This book is so fantastic that I want to hand it out to all my friends as soon as they get pregnant for the second time! 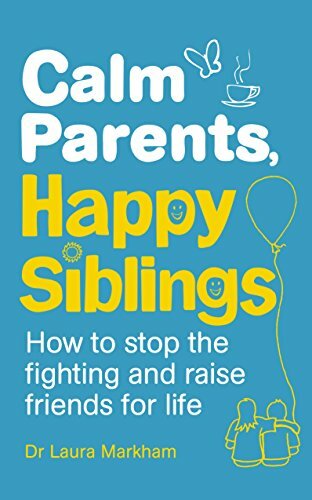 Packed with scripts and helpful approaches for managing those sibling battles. The book covers how to think about your children's relationships before your second baby is even born so it really is a practical handbook from pregnancy to primary school. A game-changer if you're sick of managing endless squabbles. After your toddler has hurt the baby they are likely to be feeling a swirling mix of feelings. Even a very young toddler will know on some level that they have done something that they shouldn't and will be feeling a natural wariness about your response. For a young toddler, under two, it's important to keep the message simple and to the point. I know sometimes it's hard to play with your sister but I won't let you hurt her. When we play we use gentle hands like this (Parent demonstrates a gentle stroke or tickle). You try. If the older child copies your actions, offer praise and encouragment. Perfect, look how she's smiling now, she likes that. This teaching approach offers the child an opportunity to learn and demonstrate a 'better version' of himself. It also helps him to focus on interpreting their siblings cues and seeing them as a potential playmate rather than a competitior. If the child doesn't want to engage in being gentle at that moment, don't enforce it - be content that you've modelled it and move onto the next part of the day. It would be wise to stay close by for the near future especially if you can tell that your toddler is still on edge. It's normal for siblings to need a lot of emotion coaching to help them learn to manage conflict. For an older child you can explore feelings in a little more depth. Start by using a calm tone and asking for their intepretation of events. Your sister seemed very upset, can you tell me what happened? Listen to their response and allow them to express any feelings they have about their sibling. These emotions might be challenging for you to hear but resist the temptation to water them down or dismiss them. Anger, resentment and sadness are all valid emotions, it's just their behaviour towards their sibling that we need to set gentle limits on. RELATED POST - THE PARENTING MESSAGE YOU DIDN'T MEAN TO SEND. Offer prompts to help them talk but find an opportunity to restate the limit. It's my job to keep everyone in this house safe so I won't let you hurt your little sister. Once they've had a chance to express their frustration and upset, offer them a chance to make amends or repair the situation. Help them to find a toy for the baby, make a them a card or get them a drink. Praise any gentle and positive behaviour you see. Just like any other learning, this will take time and practise. You might feel like you have to go through this process a hundred times. Hold in mind that you are laying the foundations for both positive emotional management skills and a wonderful and loving sibling relationship. Model the behaviour you want your children to display. It isn't easy but it works. And remember the heroic thing - I really meant that. Interested in a more mindful approach to parenting?